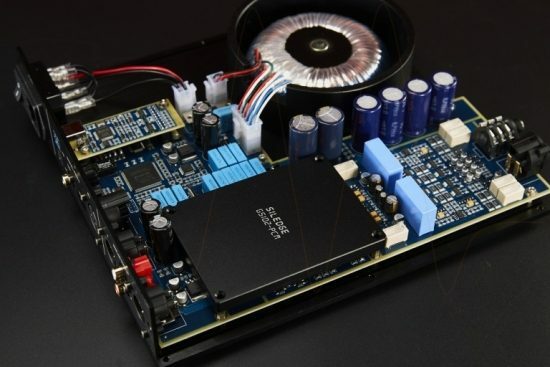 Regular readers will know about my preference for multi-bit DACs over single bit/Bitstream/Delta-Sigma designs in general and discrete ladder DACs in particular. Around 2 years ago I heard the first NOS discrete ladder DAC, the EC Designs Mosaic. It impressed me with its extremely refined and natural sound and prompted the sale of my then reference Jeff Rowland Aeris DAC. Before and after that I have used various Wadia CD players and DACs and for quite a while now the Bricasti M1 DAC. The Wadias were all multi-bit designs and I always preferred them for their bolder, purer and more direct sound. The Bricasti M1 is a Delta-Sigma design, but a very very good one, with better refinement and low-level resolution than the best Wadias that I have owned. 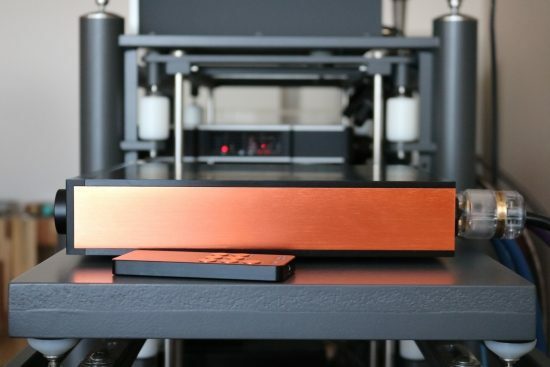 Then along came the Aqua Formula xHD DAC which instantly positioned itself as my current reference. 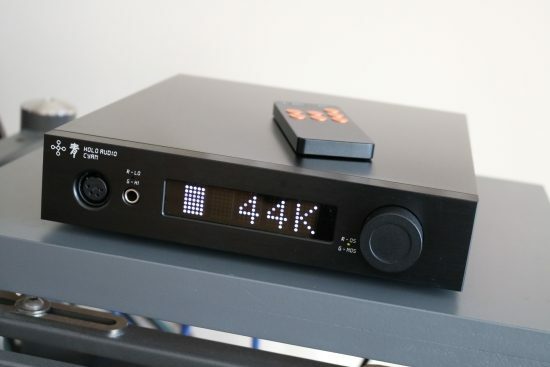 The Formula xHD DAC is a true multi-bit ladder DAC with no filtering or oversampling but with excellent output stages to provide a more powerful output than the Mosaic with its output directly driven from the DAC section. The thing is: the Formula DAC demands a very serious monetary investment. What is an audiophile on a budget, but with a craving for true discrete multibit conversion to do? Enter the Holo Cyan, a discrete, true multi-bit ladder DAC. Like the Mosaic and the Aqua, it is non-oversampling but interestingly the Cyan allows switching between NOS and oversampling to provide an alternate sound if so desired. And just like the Aqua, the Cyan has a dedicated, powerful, analogue output stage. Above: with DAC module on, below with DAC module removed. 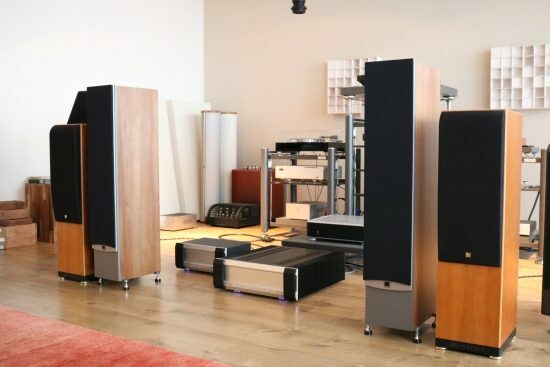 The Cyan is offered in 2 different model options: PCM or DSD but both can play DSD and PCM. The PCM version converts DSD to PCM while the native DSD version converts PCM to DSD. The PCM version offers a balanced headphone amp with digital volume control. 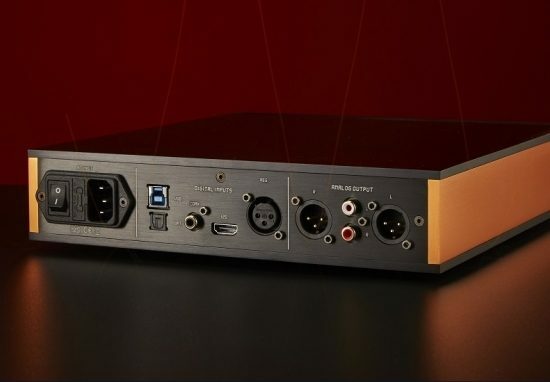 The DSD version still has the connectors on its front panel but has no headphone functionality, because pure DSD cannot be volume controlled without first converting to PCM or to analogue. The Cyan has a fully balanced headphone circuit and balanced as well as regular jack connectors on the front panel. Alas not being a headphone aficionado I totally forgot to listen to the Cyan’s headphone output. Around the back, there are XLR as well as cinch outputs. 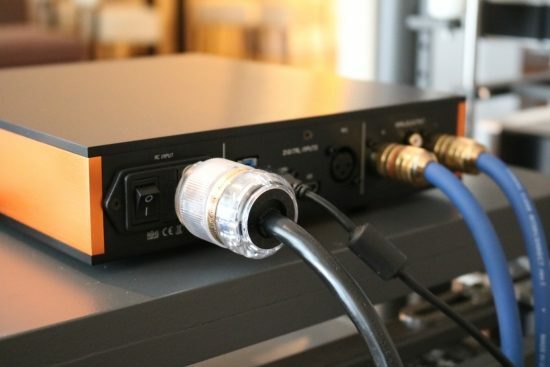 All the usual inputs are available such as AES/EBU, RCA, Toslink and USB, but also an I2S connection using HDMI to connect to a suitable source. The front panel looks deceptively simple, but there are various menu options to choose from by pushing and turning the rotary knob, for example, Volume, Oversampling or NOS, low & high Gain for the headphone Output, Input Selection and Display Brightness. 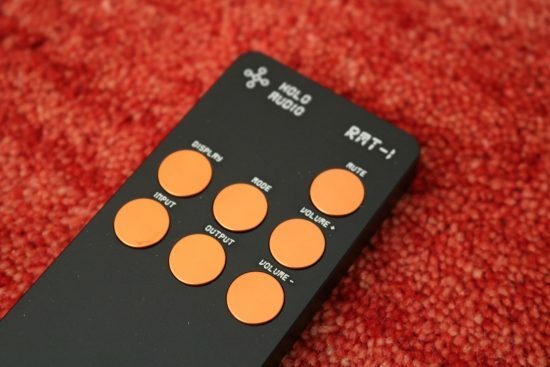 Add in the truly excellent build quality with its beautiful copper-coloured side panels and one of the most beautiful remote controls that I have seen, and it becomes clear that with the Cyan you are definitely getting your money’s worth! 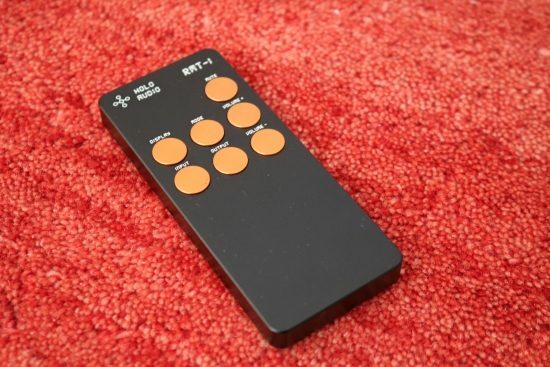 The remote control looks fantastic and allows control of all the DAC’s functions. DSD is supported on MAC (DOP) and Linux (DOP), and Windows/PC (Direct Native and DOP). According to the manufacturer, Holo Audio is the world’s first to support DSD natively on Resistor Ladder DAC. In the DSD version of the Cyan, DSD is not converted to PCM before being converted to analogue but directly by the discrete components of the DSD digital to analogue converter. I played some DSD files to confirm that it works but as I don’t actively collect and play DSD, I focused on PCM for the assessments. The word ‘R2R’ represents an architecture of resistor ladders. This architecture requires fewer resistors yet still is capable to deliver good performance. According to the manufacturer, most DACs in the industry use this architecture. The DSD module of Cyan, however, does not use this R2R architecture but uses a very specific architecture using resistor ladders, optimized to convert DSD to analogue. The DAC was new and unused when I received it and so I left it switched on for at least a week before starting serious listening. Naturally, I started listening in NOS mode. From the start, the Cyan acquitted itself as a spritely and dynamic performer. This DAC sure knows how to party! In NOS mode the Cyan sounds lively, fast and open and a little forward in the upper mid and lower treble. While it is a little bright and there is no smoothing or sugar-coating going on here, as expected from a discrete ladder DAC, it has a very pure sound and very neutral, non-synthetical timbre. Compared to the very smooth and organic sounding Bricasti M1 (using the same Cardas Clear XLR interlinks and AudioQuest Diamond USB cable) the Cyan sounds a little clean. But that is the expected result of going multibit with no filtering and no oversampling. There’s just no added blur whatsoever. The extra upsides are that dynamics really are great and the bass is tight, fast and articulate, not at all fat but plenty punchy-powerful. There is excellent focus and discrimination and surprisingly good sound staging with great layering in the depth plane and real 3D sound. 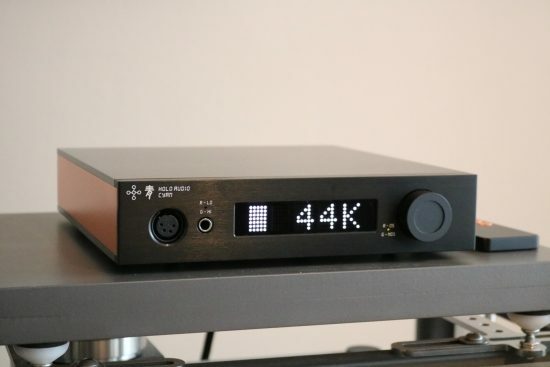 Moving further up to the Aqua Formula xHD DAC using the same interlinks and USB cable, it is clear that its premium price also buys premium performance. As could be expected, the 1350 euro Cyan does not reach the same levels of refinement, transparency and resolution as the 10 times as expensive Aqua. The latter has higher resolution and openness than the Cyan yet no hardness or dryness whatsoever. However, as long as no direct comparison is made, the Cyan really sounds very good. No matter how you approach it, it is a highly communicative and spritely performer with a neutrality that is rare, or perhaps even unprecedented in its price bracket. 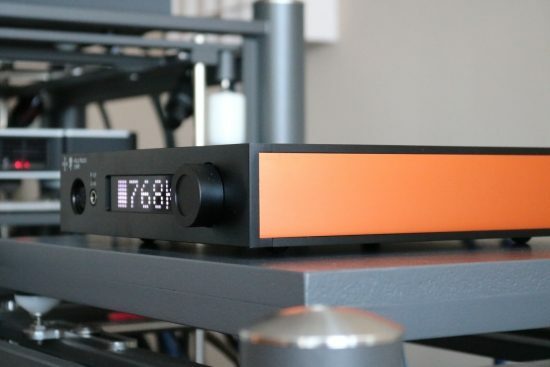 More precisely, thinking of DACs in its price range, only Delta-Sigma designs spring to mind and while some of them can equal the Cyan’s detail retrieval capabilities, none of them possesses such neutral, non-synthetical timbre or such unrestrained purity. Above: while I mostly used the Wilson Watt/Puppy system 8 I also did some listening with more friendly-priced speakers such as the Dali Ikon 6 and the Kef Reference One-two. While both sound great with the Cyan, the latter’s smoother and more balanced sound made for the most synergetic combination. In Oversampling Mode, the Cyan does not quite become the equivalent of the Bricasti, but it definitely sounds creamier and more relaxed than in OS mode than in NOS mode, and at first more pleasing, while retaining its excellent low-level resolution. However, in OS mode some of the Cyan’s enticing instantaneousness has also been diminished, while its upper mid and lower treble is still a little forward. So, while this is a nice function to play around with and it might work very well for some recordings or some combinations, overall I feel that the DAC plays more to its intrinsic strengths in NOS mode. Above: Belden power cable with IeGO IEC, standard USB cable and Cardas Clear XLR cables. The latter really are not required to bring out the max from this DAC but they are my references and such I always use them for all components under review. The Cyan shows its strengths even with a standard USB cable and a basic power cable, but like virtually any audio component, it can be tweaked. With USB cables and power cables alike, one can tweak the sound to be more fluid or more precise. The AudioQuest Diamond USB cable, for example, enhances the Cyan’s inherent strong points such as purity and articulation while the Elijah Audio Quad Braid brings a more relaxed sound with more fluidity. The Mad Scientist Heretical USB cable makes for possibly the best combination of virtues of you want to maintain pacing and dynamics but still want to induce some smoothness. 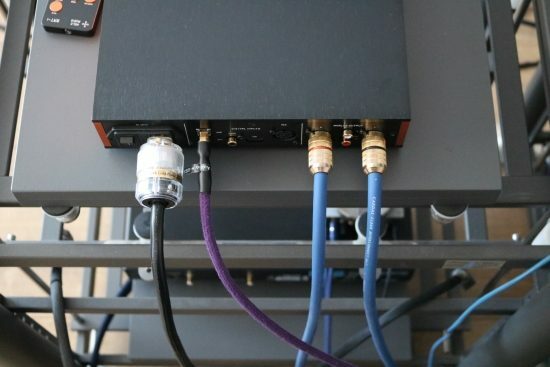 Above: the Cardas Clear Beyond power cable is way too pricey to consider with this DAC, but just for reference, it combines very well, making for a well-balanced, neutral and detailed sound with a subtle smoothness. It also proves that the Cyan DAC has all the resolution and neutrality to reveal all these differences. For power cables, I started with a standard Belden with IeGO Gold IEC and this is what the impressions of the review thus far have been based on. The Furutech FP-TC S31, which is a very creamy sounding cable does indeed lend the Cyan a considerable dose of harmonic richness but also takes away some of its speed and its pure directness. This can work well in setups that are already on the lively side but will probably be too much in setups that are on the relaxed side. The Black Rhodium Stream at 515 euro is likely also too pricey in this context but it does turn out to make an excellent match, offering the neutrality, speed and dynamics of the Belden along with a subtle fluidity and harmonic richness, without diminishing transparency. 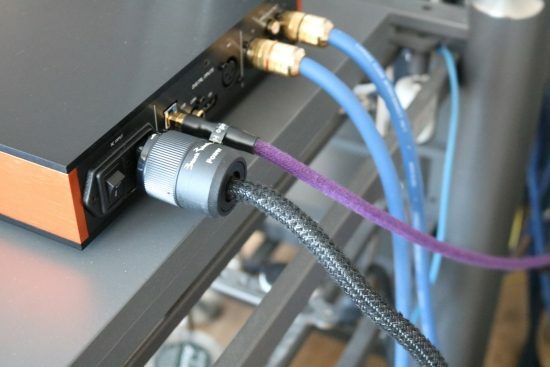 On balance though, and keeping a keen eye on the cost, the Belden might well be the best cable all round as it does not impose any character of its own, and it can be tweaked itself by using smooth sounding connectors such as those by Furutech instead of the IeGO. The Cyan promises discrete multibit NOS sound at a very friendly price in a great looking package. While not all discrete multibit DACs are equal, the Cyan delivers all the pure, unfiltered sound that is expected from NOS DACs while managing to not impose any character on top, outside of an occasionally forward upper midrange. The Cyan is a spritely and dynamic performer that relays all the excitement that is in the recordings. Importantly, while some DACs from China can sound great on the surface but ultimately timbrally unnatural, the Cyan’s timbre is totally devoid of synthetic colouration, very natural and spot on neutral. Hi, have you used it as preamp to amp (if it can it be used this way? 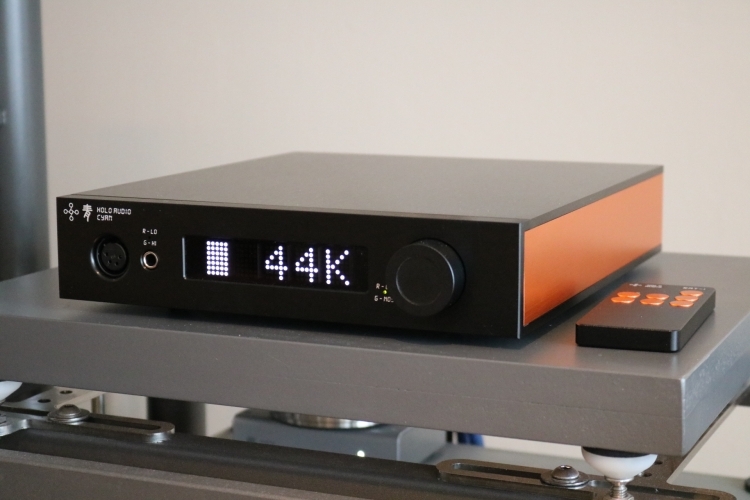 ), or only as a DAC output to another preamp stage? The review sounds very good, only this lower treble bothers me. Hi Marek, Knowing that it has a digital volume control, I’ve not used it as a preamp. 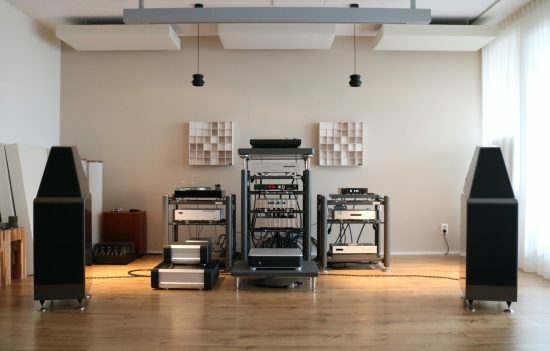 Historically I’m just not a fan of skipping a “real” preamp in my system, not even with dCS or Wadia and consorts. I did forget to listen to its headphone output and had already sent it back when I realised this. 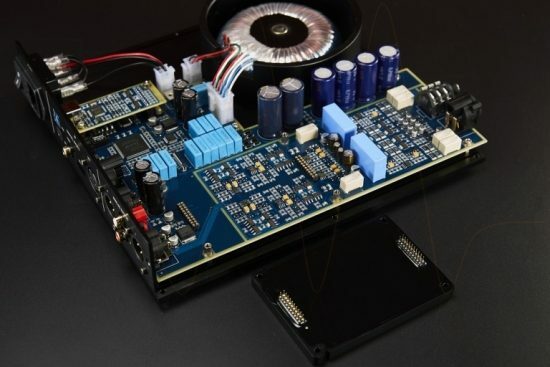 The treble prominence is there compared to other components that I used such as the Bricasti M1 DAC, the EC Designs Mosaic DAC and the Meridian 506.24 CD player. However, it is also in combination with the Wilson WP 8 speakers, which are definitely less forgiving that the Apogees that I used before this, or, say, a pair of mid-range B&W’s. So, it depends on your speakers and your personal taste. You could also perceive the Cyan as simply being very lively. Hi Christiaan, thank you for your answer. I had great results with Wadia 581i feeding directly into my amp, but this Wadia has 32bit volume control, whereas Cyan appear to have “only” 28 bit, and the higher the better. There might be some differences in compared to NOS mode but i am not sure. Certainly 28bit is better than 24bit like in Wadia 861 i think. Maybe manufacturer could clarify why he thinks is 28 bit is enough. I appreciate your reviews, because they are very truthful. E.g. no one on the Net mentioned that Wadia PowerDAC had troubles with treble, except your review. I bought despite of it, and immediately realised exactly this cut-off treble of PowerDac so i had to sell it. So now if you say this DAC has a bit more prominent treble, it is something which could be uncomfortable in the long run. Hi Marek, There are many more sides to it but the simple theory is that for every 6dB reduction, you throw away 1 bit of resolution. So if you have enough bits to start with, this might not be an issue in itself. Perhaps it has its source elsewhere but in my experience so far, almost all digital volume controls lower resolution and fluidity even when turned down only a couple of dBs. Treble becomes square and rough and overall flow diminishes. I noticed this with the dCS Delius and Elgar and it is also the case with most Wadias. 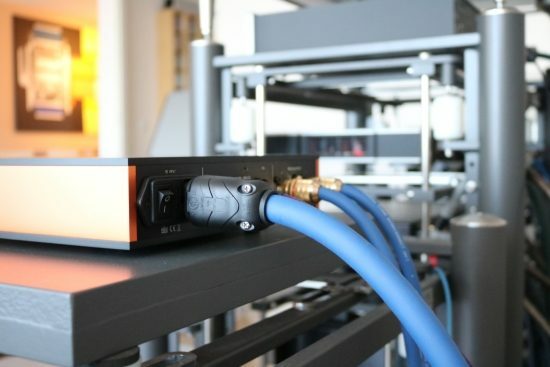 The Bricasti M1 is quite good when used on its own: resolution seems to remain up there and since it is inherently much more fluid than any Wadia, it doesn’t become dry. But still, I prefer it with a preamp. There are good things to going direct, especially with Wadias. For example, the bass becomes a lot better: more dynamic and powerful, more sonorous and also more articulate, midrange has better texture and timbre is more natural. However, the aforementioned apparent resolution reduction also happens with Wadias. The 581, 781, S7i and 521 are better in this regard than earlier Wadias but here, too, I hear a less fluid treble than via the Jeff Rowland preamp, even with the dip switches set quite low and the volume set quite high. BTW Thanks for the compliment. I think you meant, connect to a suitable source. For example. A decrapifier such as the Gustard U16. Quite right Ed, thanks for the tip. Now adjusted.